Published by Joshua Clare-Flagg on 10 Dec, 2013. 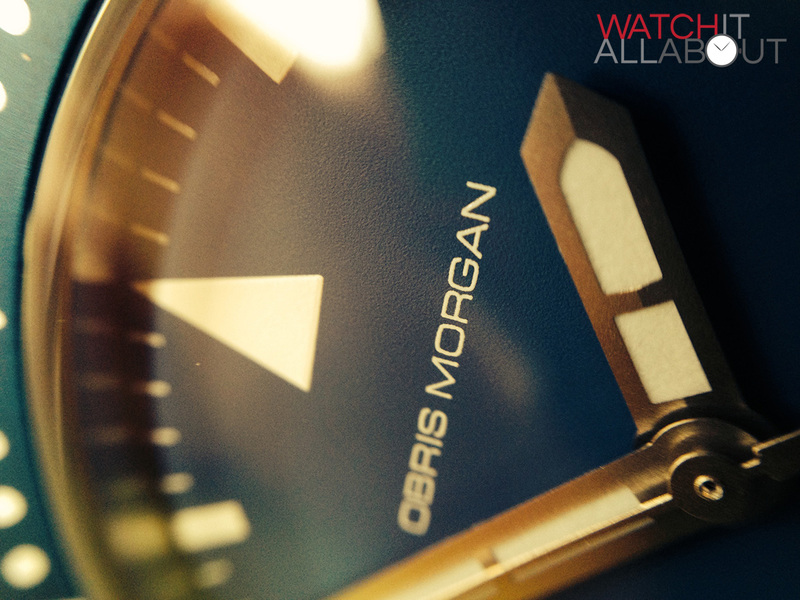 Obris Morgan have become a favourite of many an affordable watch lover. 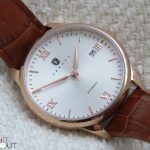 Their specs and high level of build quality for a very competitive price means that anyone who likes the look of their watches don’t really have any excuse not to buy one. We reviewed their insanely popular Branco model HERE. 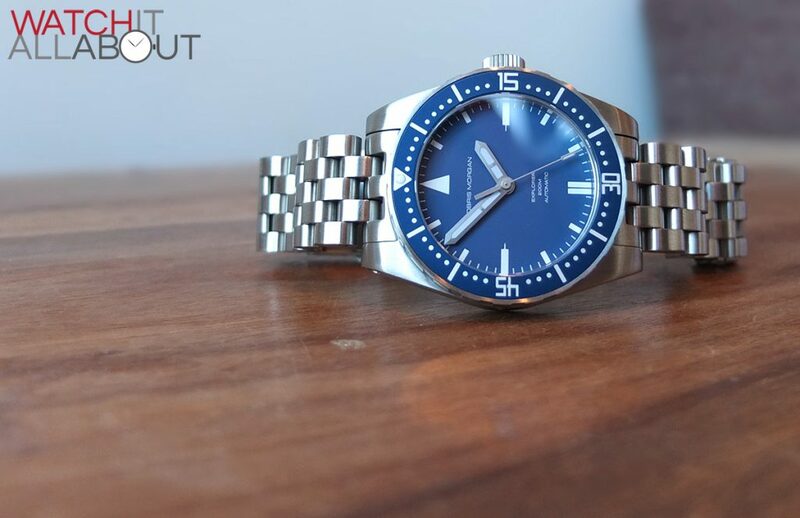 In this review, we’re looking at their latest bargain offerings – the Explorer. 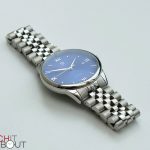 The main things you need to know are that it packs a lot of punch for $279: Miyota 9015 movement, 2.4 mm thick sapphire crystal, and an impressively build 5 link bracelet. Let’s take a closer look at the Obris Morgan Explorer to see if it really is as good as it seems. The case is very chunky and tool-like. 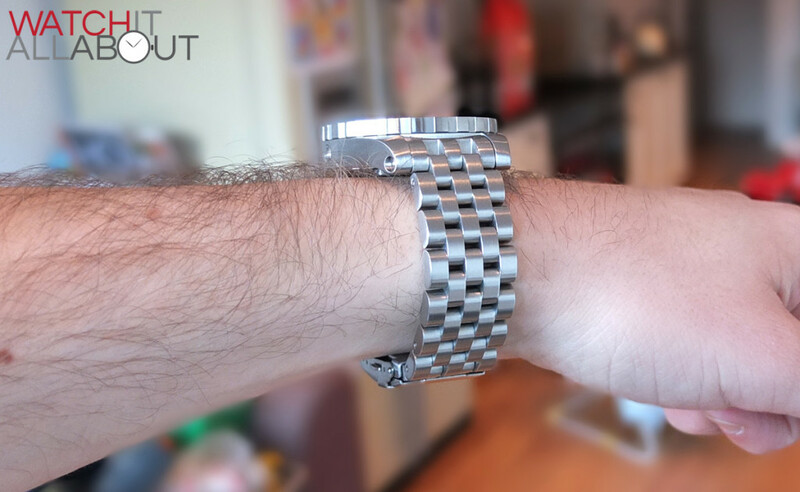 It measures up at 42mm diameter not including crown and 12mm thick – so it is quite a chunky watch. 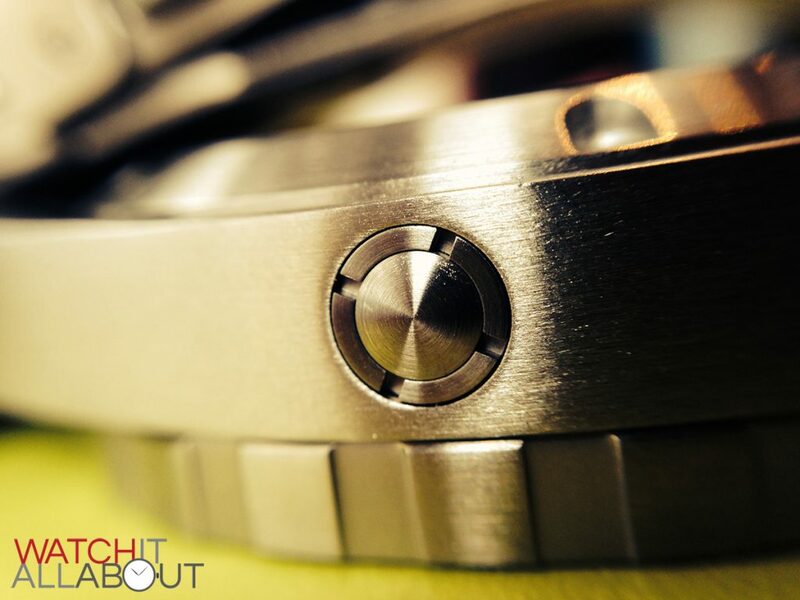 The bezel sits 3.5mm tall so it is quite a feature of the case, especially from side on. 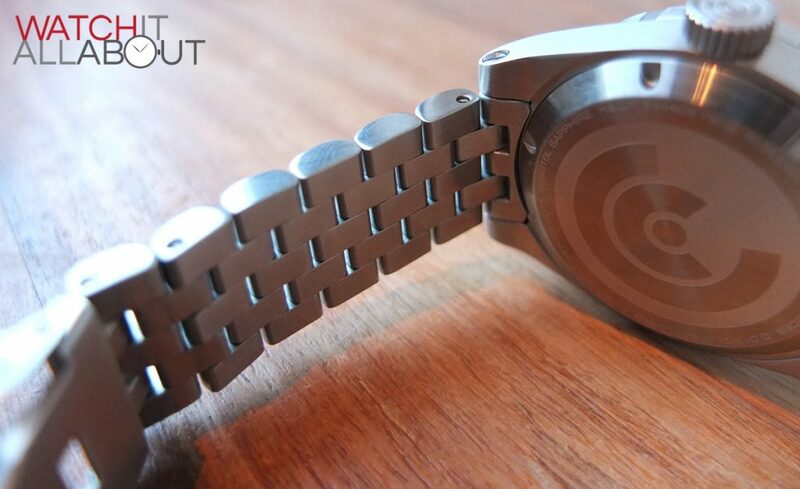 Looking at the case from above, it’s design and lines are very simple, a long archive edge from lug to lug surrounding the rim of the bezel. Side on, we have the 3.5mm deep toothing of the bezel at the top, and a 2mm profile of the caseback on the bottom. In between is the main body of the case, with a perfect brushed finished all over. It is flat for the majority of the case, bar the very ends of the lugs, where they have a slight downturn. 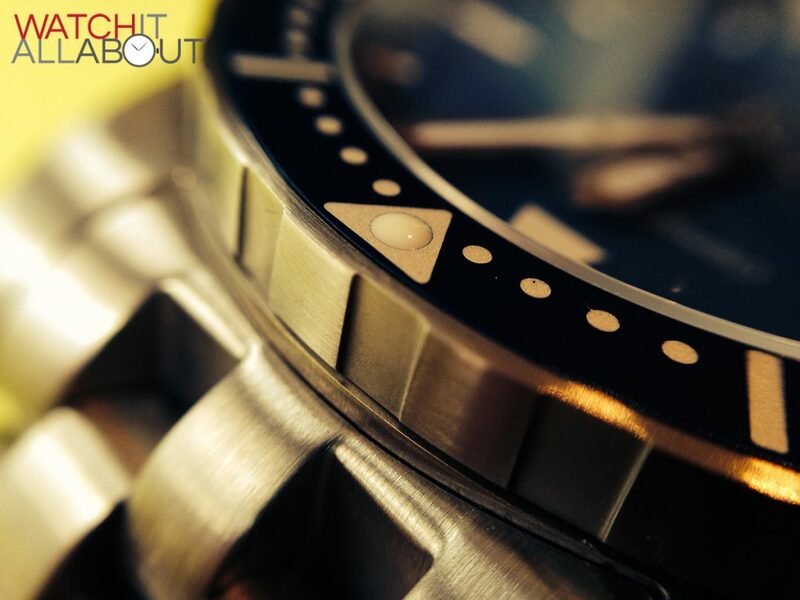 If you have a very round wrist, you may find that the flatness of the case and the lugs will result in it sitting quite high – much like the Steinhart Ocean range. If you have a reasonably flat wrist like me, however, it should sit very happily and comfortably. 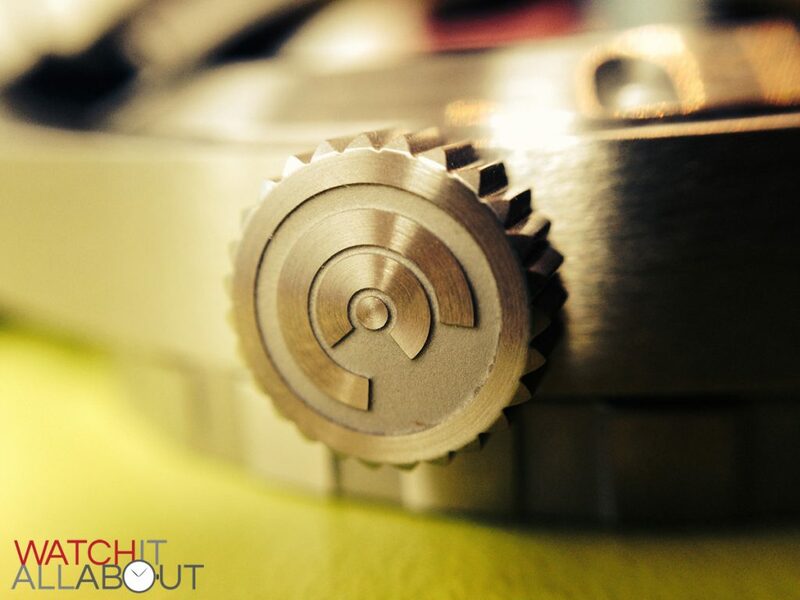 To keep the water resistance, the Explorer has a screw-in crown, with the circular Obris Morgan logo etched into the end. The etching is deep enough to give the logo a decent profile, but personally I think it could be deeper. It is very well machined and has good grip, it is easy to unwind. No crown guards are present – which gives the case a very strikingly simple profile. 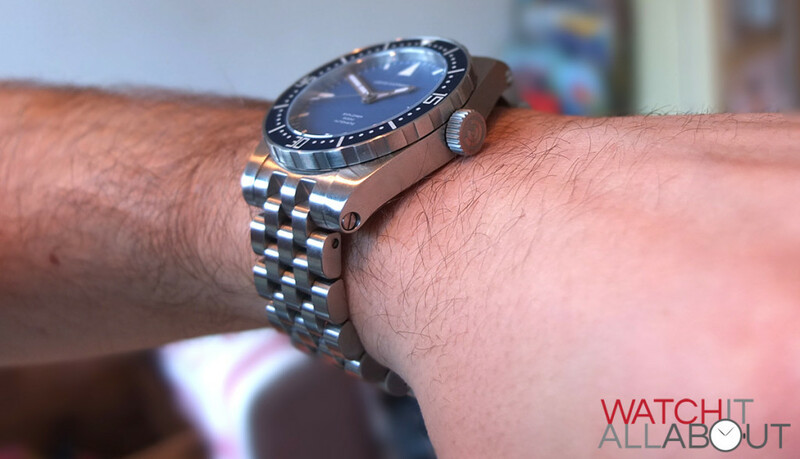 The bezel has a very nice action to it, easy to twist, whilst still being stiff enough to not be knocked and altered (important for timed diving). 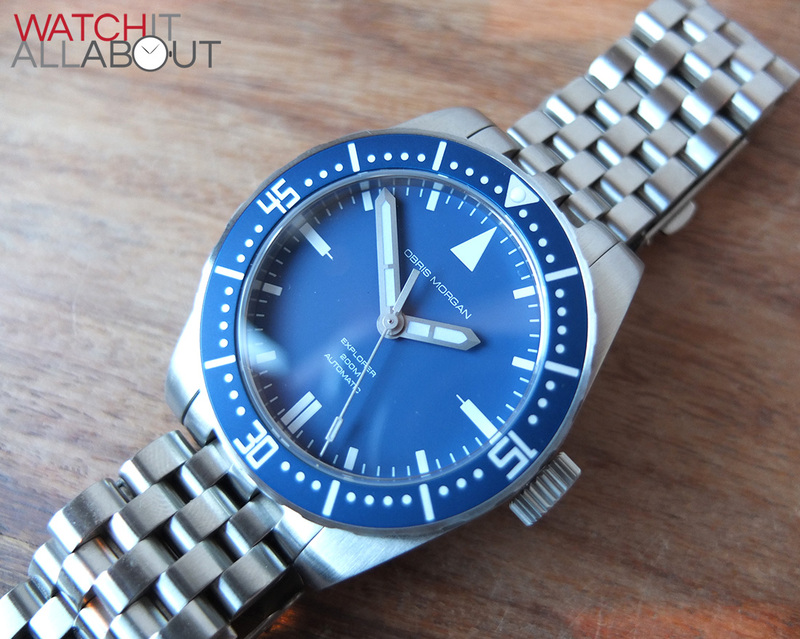 The blue insert of the bezel matches the dial very well, but seems to be ever so slightly darker. Some people have mentioned being annoyed by the 30 being upside down when it is rotated – but this really doesn’t bother me in the slightest. 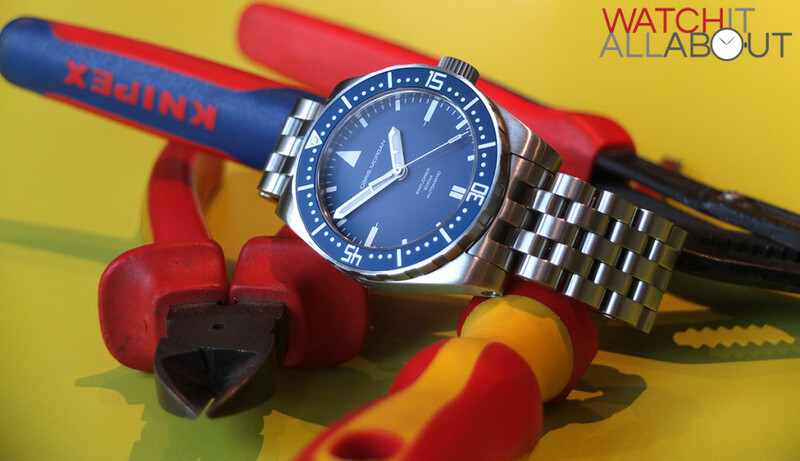 There are actually a number of watches which do this – the most famous being the Blancpain Fifty Fathoms. 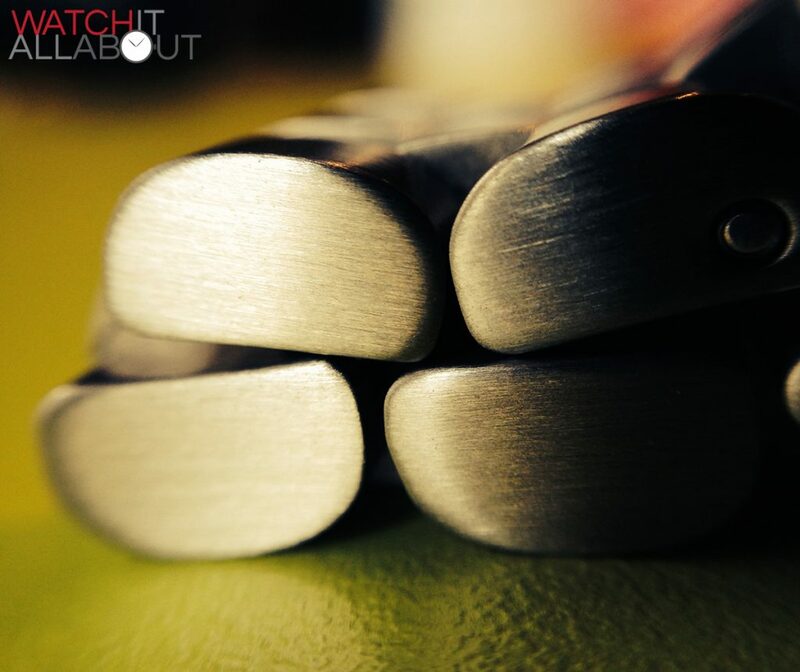 The outer edge is very well machined and offers very good grip. It does have a reasonably sharp top edge though. 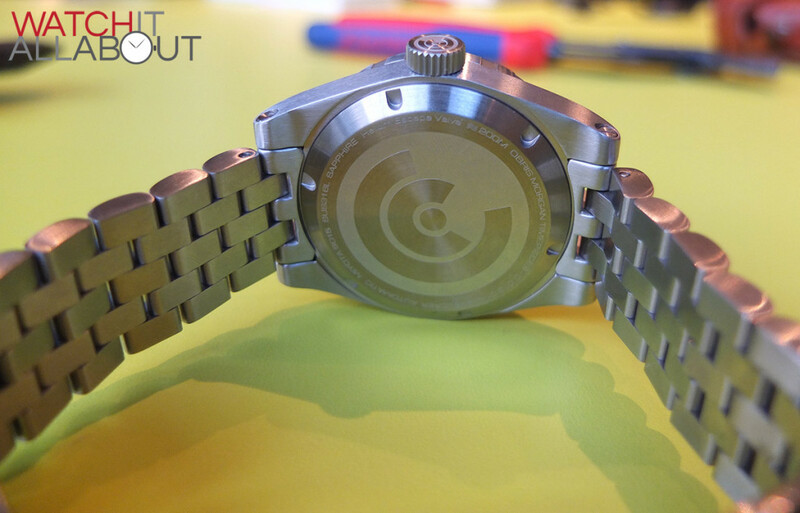 The caseback is screw-in and features a large Obris Morgan logo in the centre. This is quite lightly etched though which is a shame. 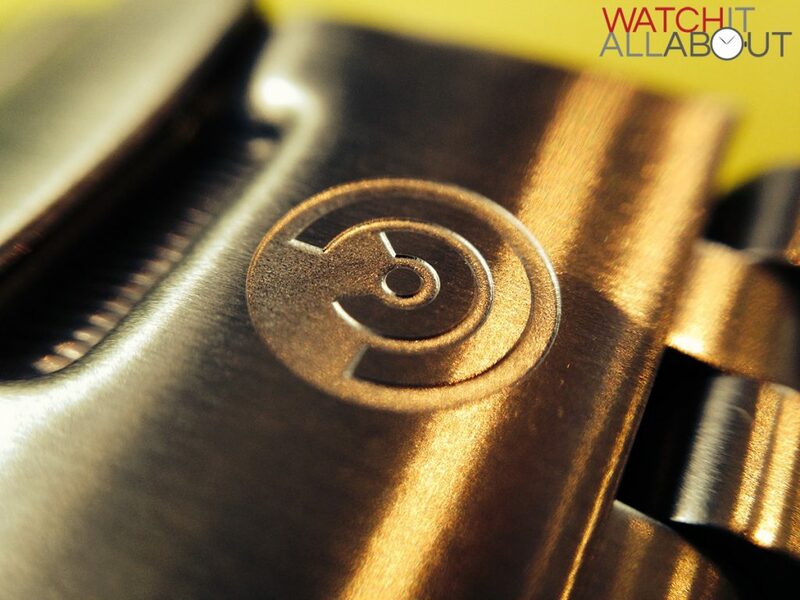 Around the logo are the watch specifics, again lightly etched. On the side opposite to the crown is a helium release valve. This is a nice feature, not that it is necessary as it would only be required at depths of greater than 300m, and the Explorer is rated at 200m. 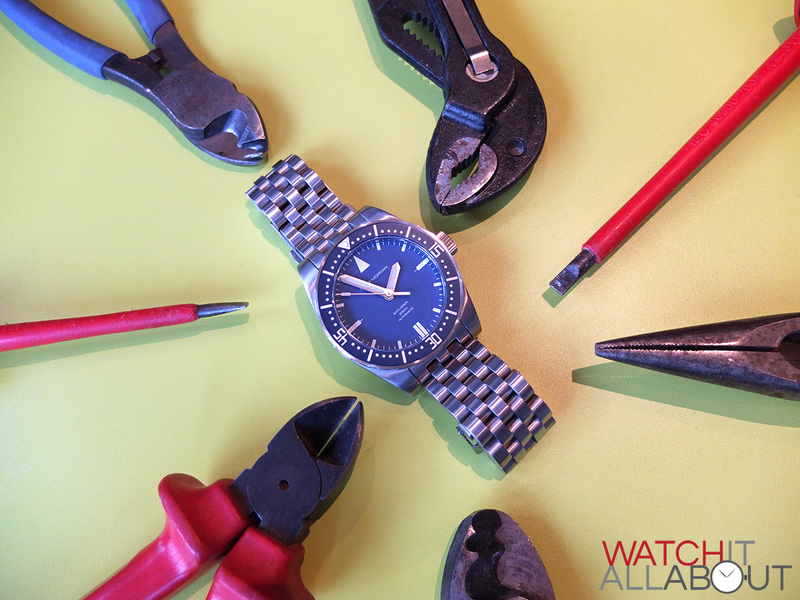 But, it adds to the overall “ready for anything” vibe the watch displays. Atop the case is a very thick 2.4mm sapphire crystal. It does have a layer of anti-reflective coating on the underside, but it doesn’t appear to be that effective. 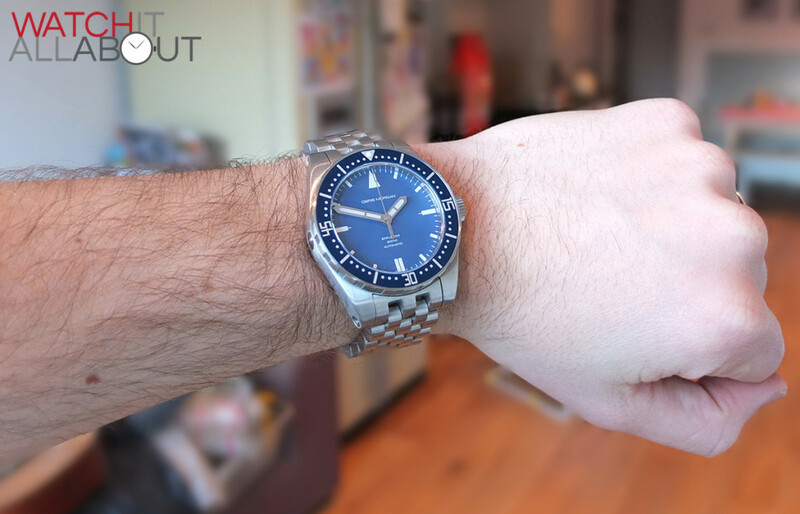 The thickness is seriously impressive for a watch at this price, as this is similar to Swiss Made divers in the £500 bracket. It also gives you great reassurance that it’s not going to damage easily. The case in general is very well machined and made. It is very refined and is quite staggering for the money. 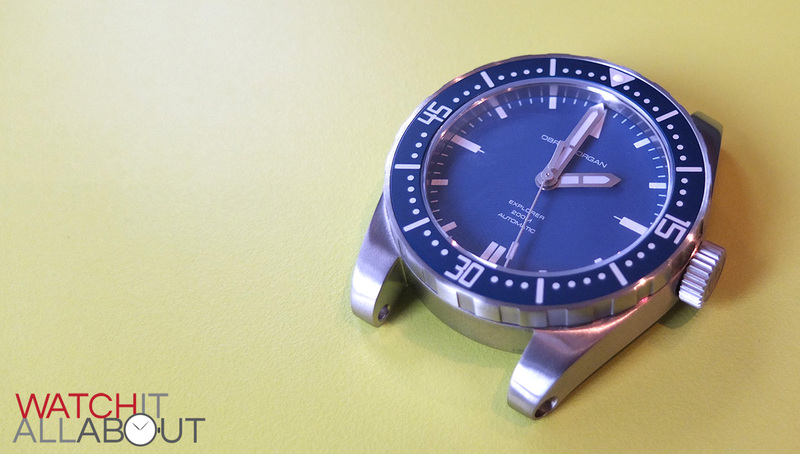 The dial is very simple, with minimal markings and printing. The only printing on the dial is “Obris Morgan” in the top half, and “Explorer”, “200M” and “automatic” in the bottom half. 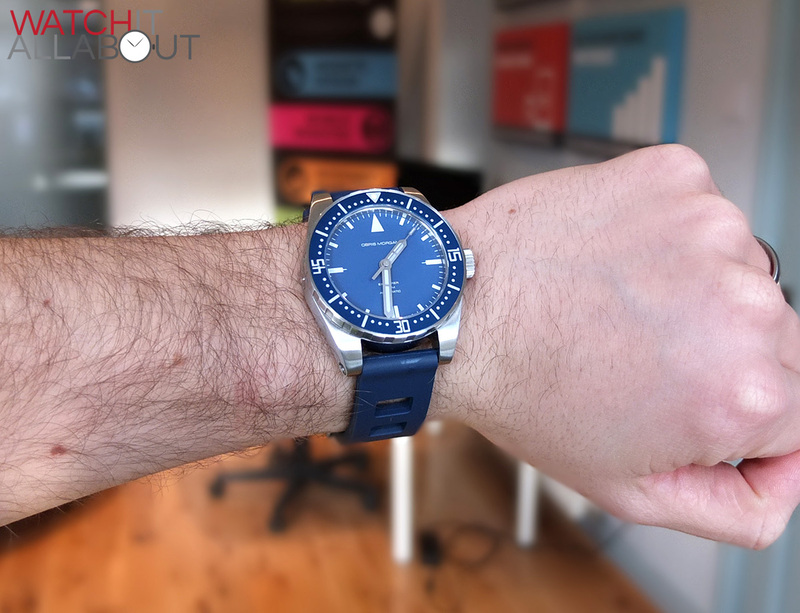 The size of the text is all quite small and subtle, which is good in a design point of view – it doesn’t really overpower the general aura of the watch or demand too much attention. There is also a minute track around the outer edge, which larger lumed markings for each hour. All the printing on the dial is very good, with no flaws visible at all. The hour markers are all nicely designed, and it’s clear that a lot of thought has been put into the design. They could have very plain batons at every hour, but did not. At 12 we have a large triangle, at 6 there is a long double baton, and at 3 and 9 we have long single batons with a small line protruding out – almost like a cross hair. All of the other hours are shorter batons. These are small details you wouldn’t normally notice, but it’s good to see the time dedicated to the design. 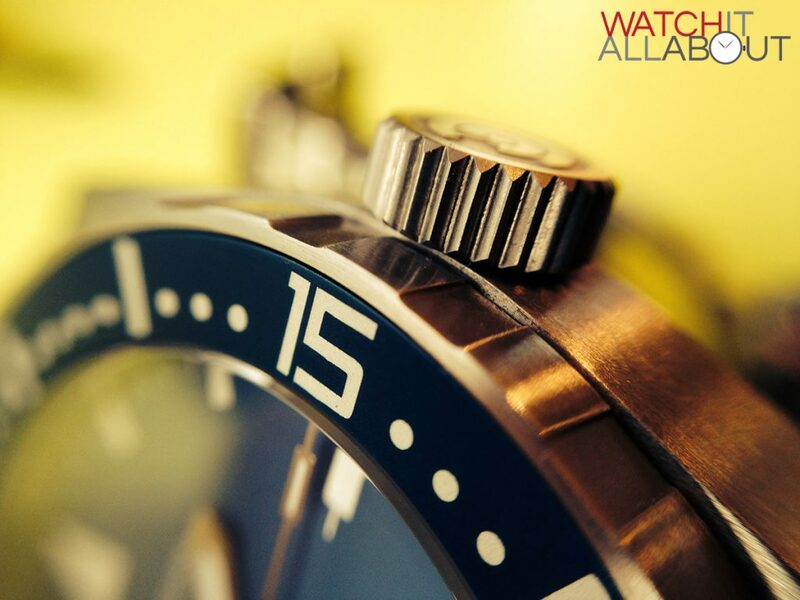 The colour of the dial is a splendid sea blue. As I mentioned earlier, it is slightly lighter than the bezel insert, but in everyday circumstances the difference isn’t really evident. For me, it offers a great alternative to the usual black faced divers, which have flooded the market a bit. The blue Explorer is definitely colourful enough to be noticed from a far, but isn’t too harsh that it looks tacky or distasteful. 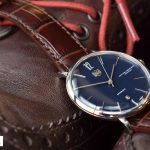 The hands have a very attractive blasted finish to them, giving them a matt appearance which results in rather high legibility against the blue dial. The hour and minute hands are both similar designs bar the length – they are thick rectangles with a point on the end. They are fully lumed, with a break in the middle separating them into two sections. The second hand is a thin stick, with a thick rectangle as a counter balance and a smaller rectangle at the top end filled with lume. 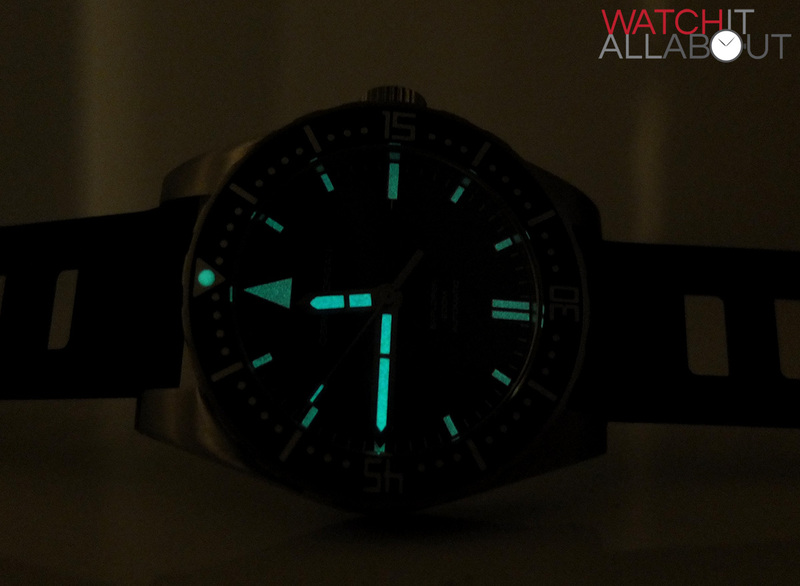 The lume is all green and fairly evenly applied. It is average strength, and charges at a normal rate. All the hour markers and hands are lumed, which does give a good amount of legibility in the dark. The pip in the bezel at 12 is also lumed. 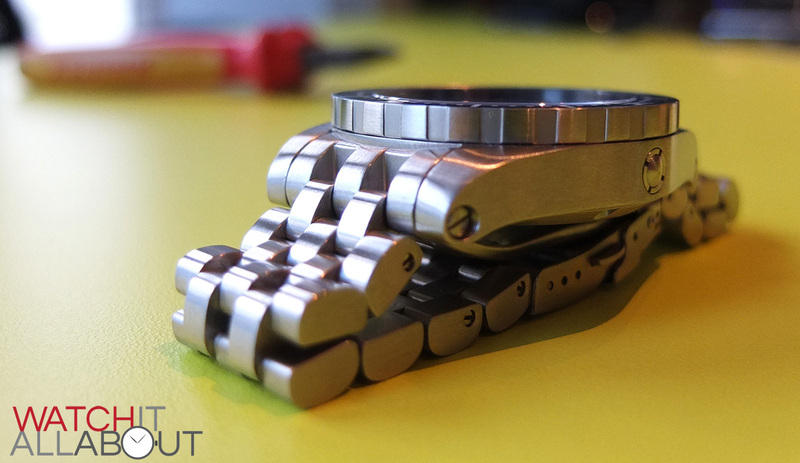 I really like the look of the hands, I feel they compliment the watch perfectly. I think Obris Morgan have done a brilliant job on the design of the dial on the Explorer. 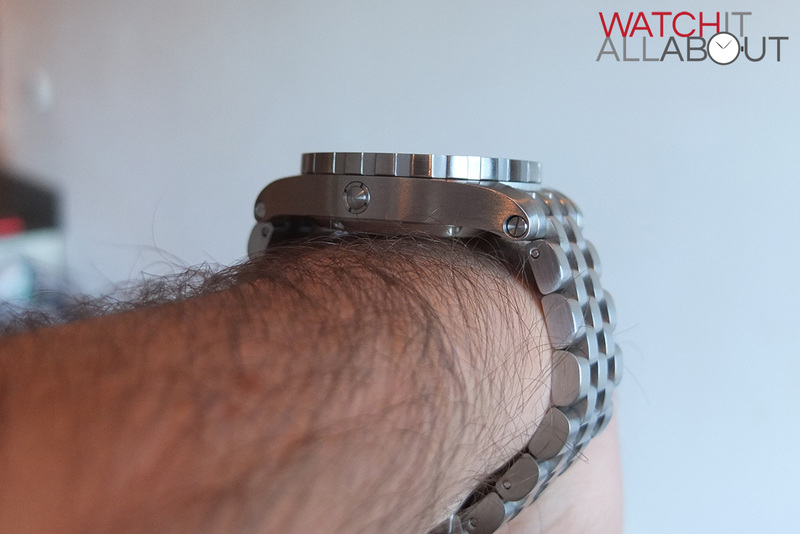 The 20mm wide 5-link bracelet is another very positive selling point of this watch. It really is very impressive for the money you are paying. There are no sharp edges on any links, they are all immaculately machined with great rounded edging and corners. The links are very thick – you get a lot of steel for your money! The end lugs are solid, but I think they could fit the case a little better. There is a very slight bit of play there and you can see a tiny gap through where it doesn’t quite hug the case back on. But, let’s not forget the price of this watch. The links have good quality screw-in pins, which means it’s simple to resize. 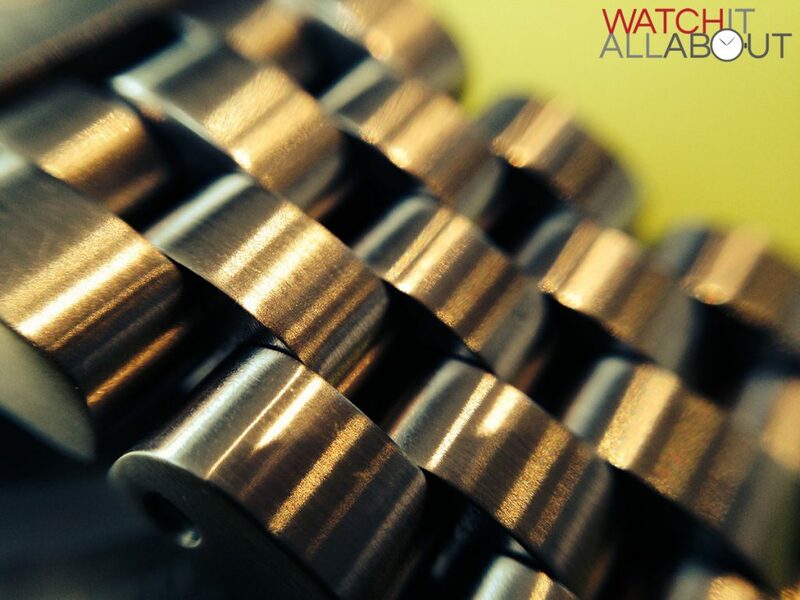 They screw in and out very easily, it is evident that all threads and screws are well machined, with no dirt or grime in them. The case has through-lugs, which also means it is easy to change the straps. This means that there is one long pin holing the strap which can be accessed either side of the lugs to be unscrewed easily. Again, this is all very well done and all the parts feel and look good quality. 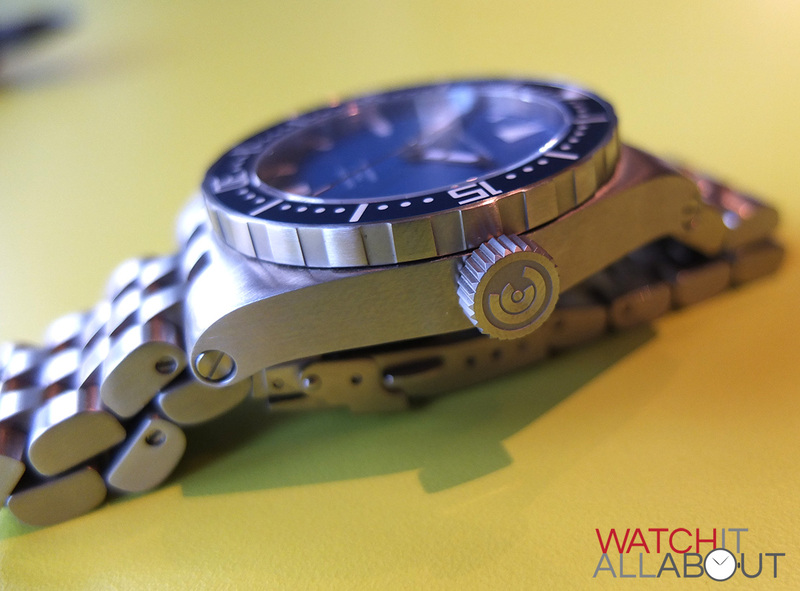 The double locking clasp is heavy duty, it reminds me of the clasp on the Seiko Monster (now that’s saying something!). It has the Obris Morgan logo engraved on the top, which looks good and breaks up the large slab of steel well. The whole feel of the bracelet is high quality. The way it is designed and built with the 5 links means that it is exceptionally comfortable and malleable. 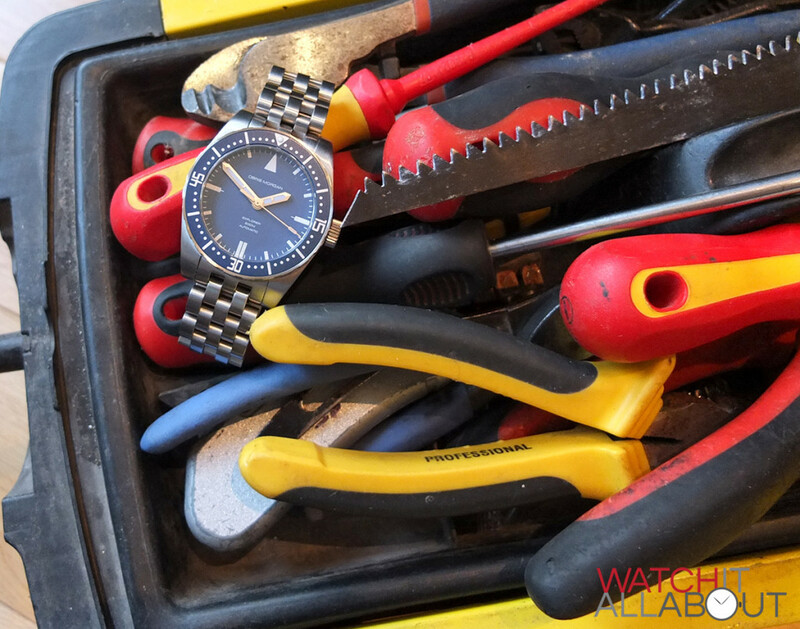 The extra rubber strap is a great addition, especially being that Obris Morgan provide a neat little screw driver to make swapping them easy. 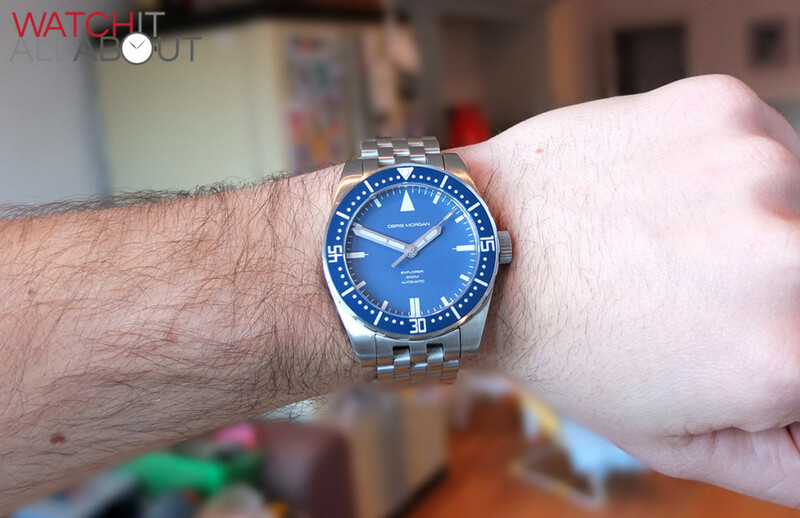 The rubber is deep blue to match the bezel and dial which is a nice touch. The rubber is surprisingly soft and bendy. 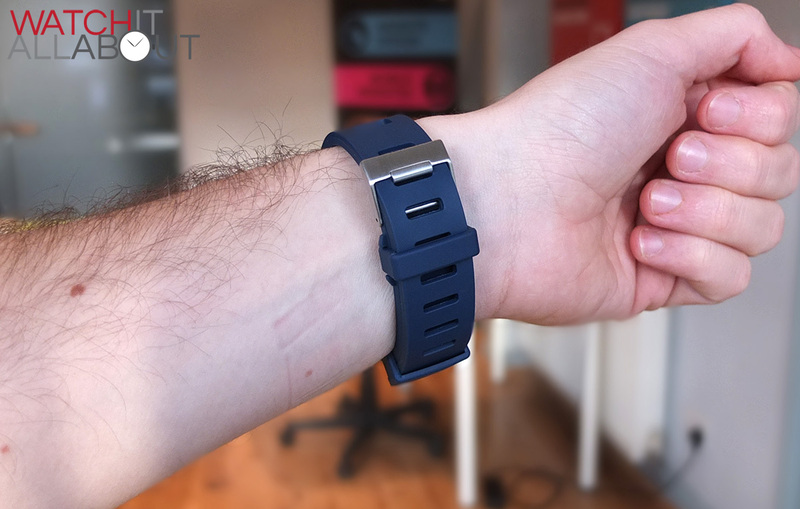 It is also a pleasant surprise that it didn’t really irritate my wrist whilst wearing it, which is a positive – some rubber straps can be extremely uncomfortable to wear, but that’s not the case with this one. I really like the design of the rubber strap, with the wide aggressive holes and extra rectangular holes at the top of both sides. The buckle is well machined with a matching wide pin. Unfortunately it doesn’t have any branding on, I think it would have been nice to have the logo etched on there, but nevermind. 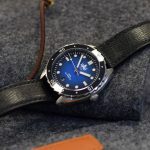 Powering the Obris Morgan Explorer is a Miyota 9015, which is proving to be extremely popular for small boutique brands who want an affordable equivalent to the ETA 2824. 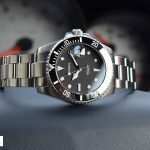 It offers the same specs – automatic, 40 hours of power reserve and runs at 28.8k bph (8 ticks per second) but is much more readily available and also a lot cheaper. It is made by Citizen, which gives you reassurance that it is good quality. It has proved that it is a real work horse, being sturdy and reliable. The accuracy has been quite good, with no massive amounts of deviation in time. The 9015 has a hacking second hand (which means it stops when you pull the crown out to set the time) so you can set it with accuracy, and you can also hand wind it. It does have a date function, but obviously the Explorer doesn’t have a date. There is only one small downside to the Miyota 9015 though, which is that the rotor only winds one way (which is clockwise if you were looking at the case back). This means that it will take longer to wind up from the wrists natural motion than a movement which winds both directions. 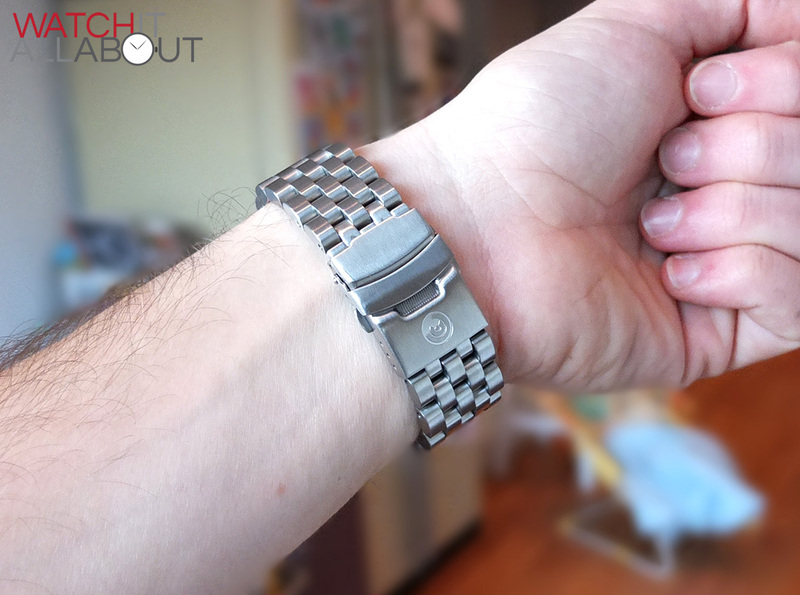 If you were wearing the watch regularly though, this is not going to affect you. 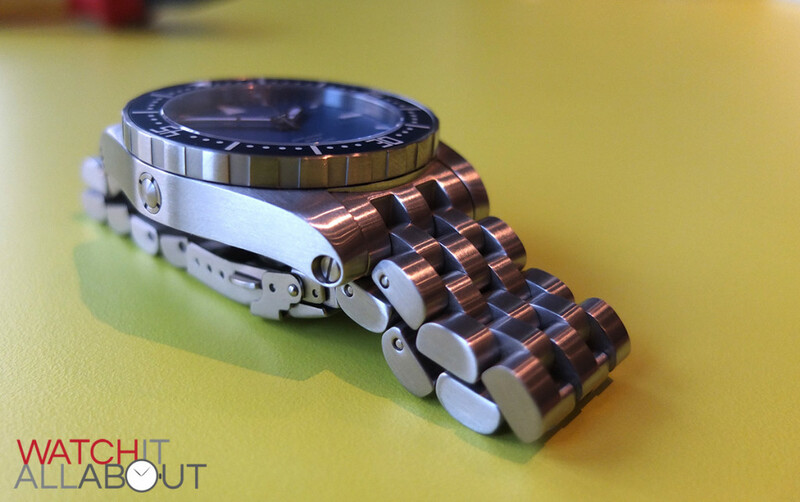 As you would expect, the movement feels sturdy in the hand when you are winding it or setting the time. The Explorer comes packed in the usual Obris Morgan fashion – their well known pelican case. It offers brilliant protection whilst travelling and is a refreshing change to the usual leather box. 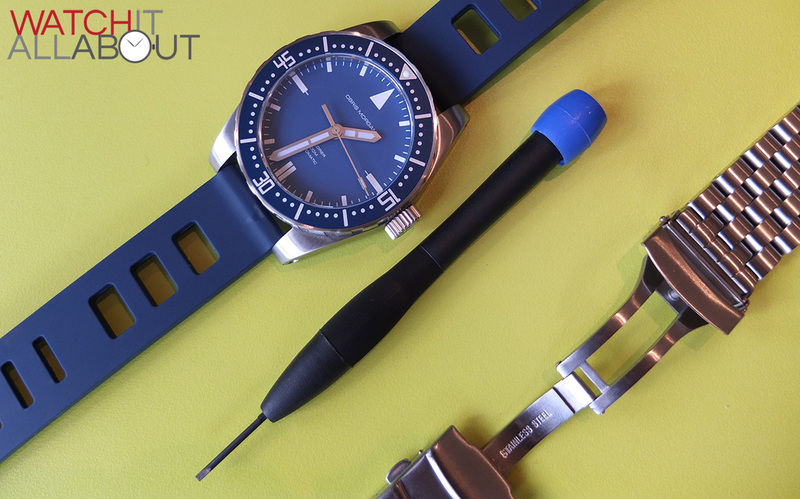 All the extra bits are nice too – the tool to change the strap, the extra rubber strap, extra pins, and even just the paperwork – are all great little touches which make owning the watch all the more pleasurable. The Obris Morgan Explorer really is a lot of watch for the money. As soon as you put it on you’ll realise that – the thing weighs in at 214g. 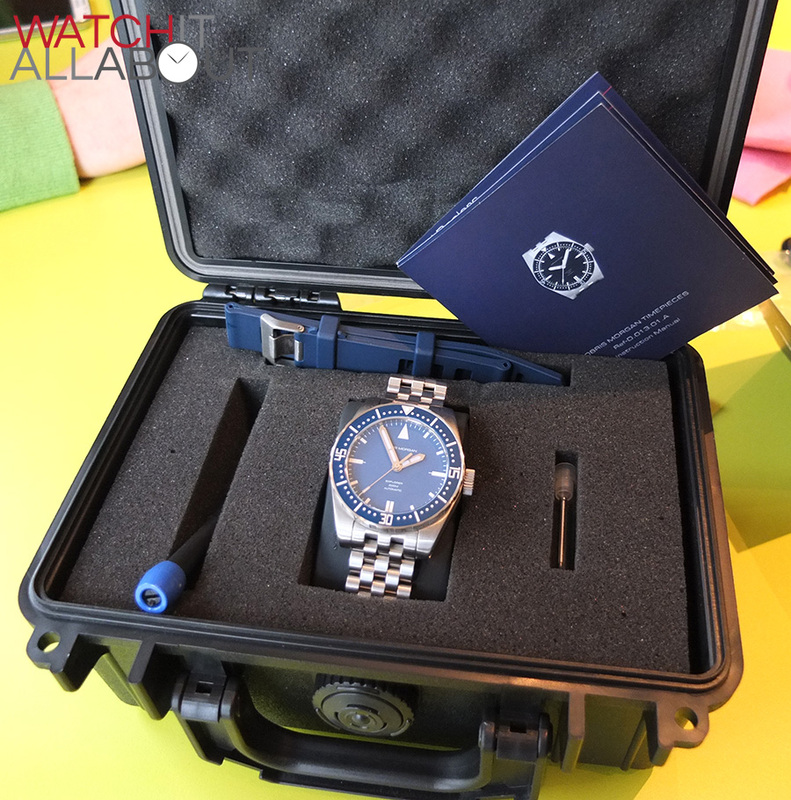 The whole package is great from start to finish – from the case and documents, the watch itself with rubber strap and the little extras you get too. They have put a lot of thought and effort into the buyers’ experience and for this I commend them. Obris Morgan have proved to us in the past with the Branco that you don’t have to spend a fortune to enjoy a well made, high spec watch. And they’ve demonstrated this once again with the Explorer. I understand that it can be a specific taste – but if you like it, then there is nothing I would or even could say that would say that would prevent you from ordering one! I got my Explorer today and did some weighing as Josh’s review refers to it being weighty @ 215gm; this being with the bracelet. Mine’s on the rubber strap @ 116 gm with the bracelet weighing in @ 119gm. This makes the watch on its own 96 gm. For comparison my CWL C9 chrono on a medium weight strap comes in @ 124 gm; say 104gm on its own. I just pulled the trigger on the Pradata preorder and can’t wait for their release in June. 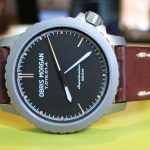 I’m absolutely blown away by the price of the Obris Morgan watches given the manufacturing quality and features. I just wish I could have snagged a Branco before they sold out. The second hand market of these seems to be non-existent. 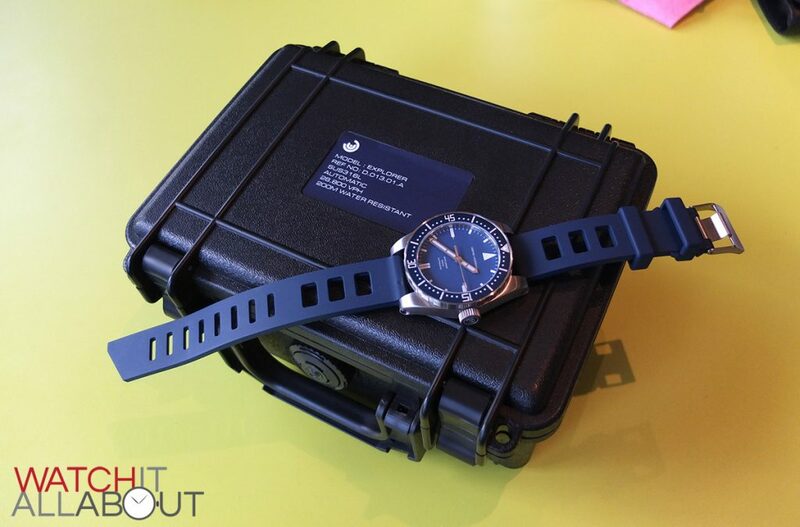 Last year (2015), I purchased two of the OM Explorer II models — one all black and one with the black bezel and blue/black face. They are an EXCEPTIONAL value. The heavy duty, thick, 5-link bracelet (with screw links) is really outstanding. The fit and finish is excellent — not just good or acceptable. OM is a boutique company based in Hong Kong, but the know what they are doing. While there is a very small language barrier dealing with their sales rep “Justin” I have found him to be honorable and trustworthy. I would not hesitate to purchase from Obris Morgan again. 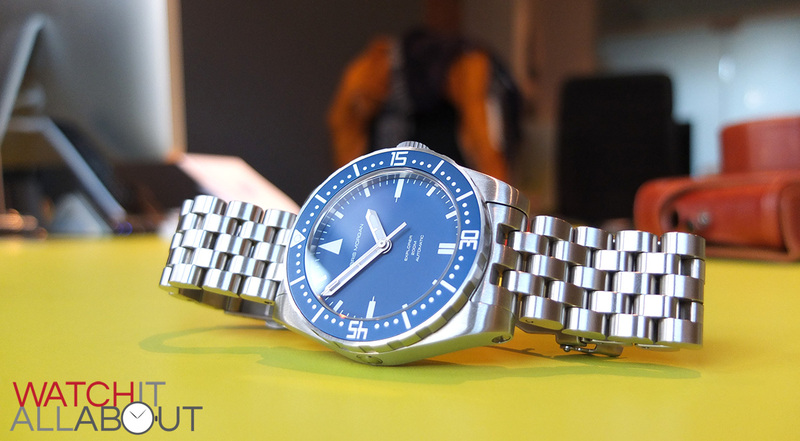 In the future, I intend to write a review of the OM Explorer II. It’s one of my FAV “go-to” watches. FWIW, I’ve been collecting, buying and selling diver watches for 3+ decades.